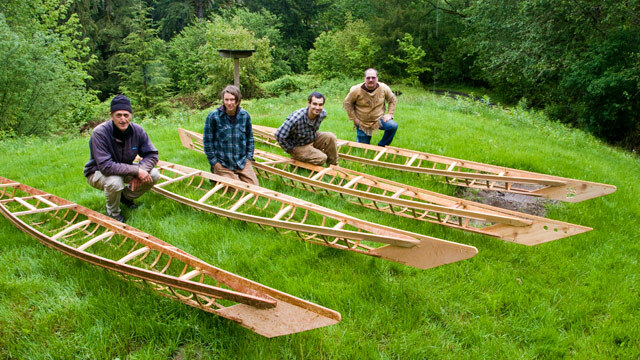 A few weeks ago we built five new boats at our new workshop outside Portland. Alex to our left here came all the way from Calgary, Alberta for this one and she built a beautiful kayak. Awesome. One more person closer to nature, 5 billion 999 million to go. Our new location, at the mouth of the Columbia River Gorge, is close to the top of a cliff that overlooks the famous river gorge. It’s pretty quiet and remote being so close to Portland. Our happy crew with their finished frames sit on a rare moment when it wasn’t raining this week! At the beginning we lay out the frames with forms for guidance and then cut the deck beam tenons and receiving mortices. 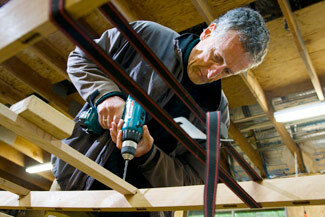 Then we peg the deck beams into place. Then begins the exciting part– bending the ribs using steam! Kiliii bends a fresh hot rib with aplomb. 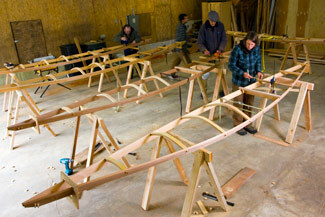 Then we lash the stringers onto the ribs and the rest of the framework. 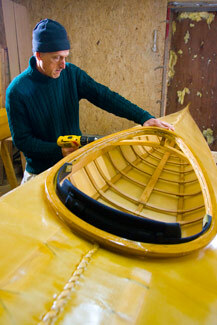 Finally, we carve and then lash on the bow and stern stem scantlings. 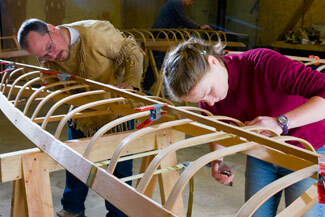 With the frames completed, we start to skin the kayaks. 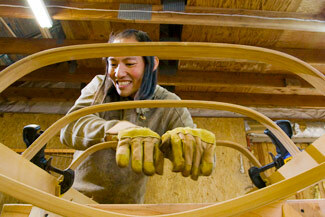 By now people are starting to get attached their kayaks and to working on them. It’s hard to stop for lunch! And then, quite suddenly, the skins ready for their waterproofing with a few coats of polyurethane. 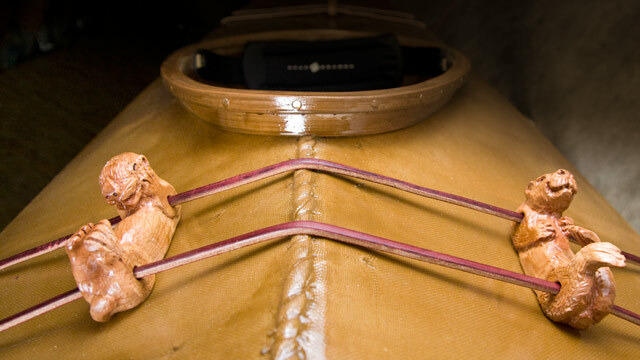 We use a special polyurethane designed for skin-on-frame kayaks. 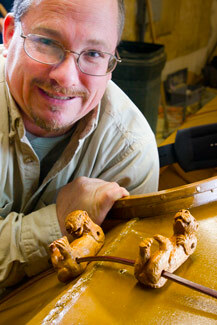 Kirby, being an accomplished woodworker, went above and beyond for his kayak. 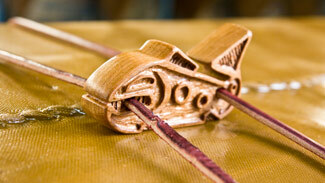 He carved out a series of beautiful deck toggles for this boat. We also discovered the sea otters work great to hold a paddle on the deck when you’re not paddling! 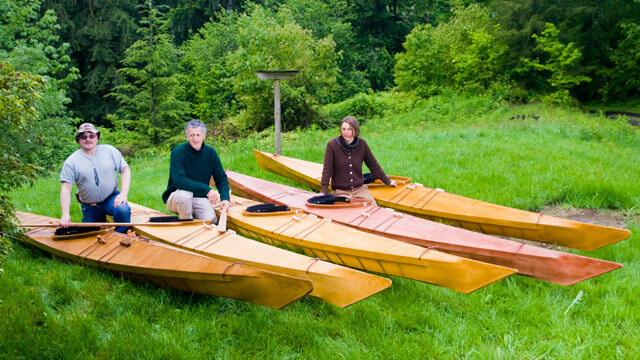 Okay, these must be about the coolest thing to ever grace a modern skinboat. 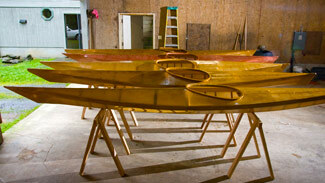 And just like that, the boats are done and we are ready to hit the water. Oh. My. God. I am so believably excited by this. Truly beautiful. I would love to hear how they paddle in our local waters. Ever do a workshop in the SF Bay Area? Indeed! 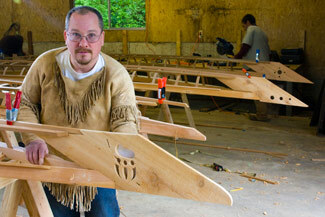 I have a workshop in Forestville, CA, at the end of April 2011. Check our calendar for more information.